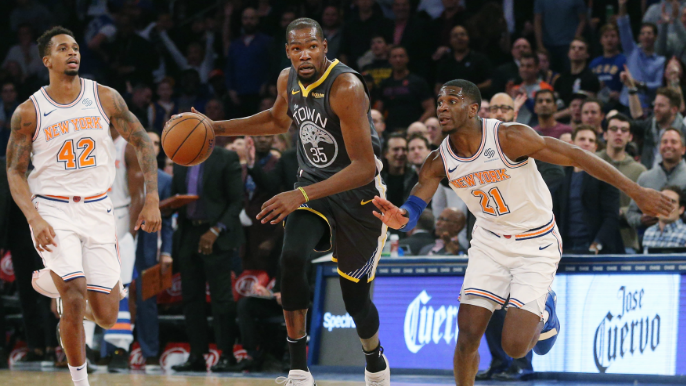 The discussion surrounding Kevin Durant’s future with the Warriors has been predictably consistant throughout the regular season, but has ramped up recently after the Knicks shocking and swift trade of Kristaps Porzingis on Thursday. The Knicks made the trade for the primary purpose of opening up cap space next offseason, reportedly so they can sign expected free agent Durant, and another max player. Durant hasn’t exactly gone out of his way to quell concerns about his exit since the trade went down. He reportedly hasn’t spoken to the media once since last Wednesday, and at shoot around on Tuesday, “brushed off team PR” according to Dieter Kurtenbach of the Bay Area News Group. Publicly, the Warriors are maintaining that they are not concerned about a potential Durant exit this offseason. “I feel like all of our players are happy and want to stay with us,” general manager Bob Myers told reporters on Monday. Behind closed doors, however, there is concern, according to longtime NBA reporter Marc Stein. On Tuesday, Stein posted a piece for the New York Times breaking down the Porzingis trade, and included a nugget about the real concern in the Warriors facility about KD leaving for NYC. But I can tell you this: In my discussions with rival team executives, I’ve heard from many more who praise the trade — believing the Knicks must have some promising inside information about their ability to lure the likes of Durant and Irving — than from those questioning how much the Knicks received in return. I can also pass along that the threat of the Knicks’ persuading Durant to leave one of the most dominant teams in league history has never felt more real to the Warriors themselves. Durant has not been asked about his free agency by local reporters for sometime now. Whether that changes the next time he speaks to the media will be something to monitor, as will how he responds to such questions. Stein joined KNBR on Tuesday after posting his report, and talked about what got the Warriors’ attention regarding the Porzingis trade.